One last final Maob moment. Cleaning Moab off my truck. Shout out to all the 2016 Moab crew. Especially My 6 days of Moab Homie. Now Moab is in My driveway. Moab was a fun trip for sure. I just unloaded the rest of the 4Runner last night. You'll think twice about washing the red dirt off your driveway, but I am positive there is still some in your 4Runner. There will always be some red dirt in the carpet! I still have some on my cooler. Tell your camera man to turn his phone horizontal when taking videos. It's possible that the goal in the Wipeout Hill video was to show the obstacle top to bottom, but it's possible it wasn't intentional at all. Isn't that optimistic of you! If it's a repeat trip a Jeep can be invited but not show up! right now if my fellow 4Runners are going also. I am sure there are more I don't even know of? 4Runner fest!!!!!!!!!!!!! And a jeep. That's for you Jk. No dice on my end. Going somewhere new next year. My next planned big trip will be Alaska next fall hopefully. Depending on the type of trip you are shooting for, you could pack 5 people into a KOA cabin and keep lodging to under $150 per person for a week. Two rigs and one cabin. Maybe a Chris and Chris "family" trip is in order with Arches and Canyonlands as the focus. We want to see Denali National Park. We also have friends living a few hours from there that we want to see. Please, Ben. Tell us more stories of the force and the old days before Toyota fell to the temptation of the dark side. Now we need a picture of that there papa smurf in your avatar. Then you can start on your build thread. Driving 4runner around yesterday and had the battery light and brake light come on. "classic alternator failing"
I would like to look into all possible optioins as I do have a winch and tend to wheel with Jeeps, thus have to use winch often. I know there are several different methods to addressing the slightly undersized alt that Toyota has supplied us with. nothing is to exotic. Also I would like to be able to run an onboard welder in the future so take that into account. You should ask BigMike about his dad's setup [I PM'd him and CC'd you]. 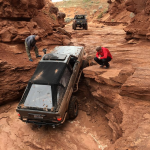 There's some info on it on last years Cruise Moab thread because it died and killed his opportunity to go wheeling. It's some type of GM conversion. If you ever need a tug and there's a Jeep in the group you can bet which one I'll have come get you! Mine was an GM one built by Powermaster. Sold it when I started the 4.3 conversion. I used a low RPM H.O. Worked great for me. Can you get me a link mark. Page created in 0.357 seconds with 38 queries.